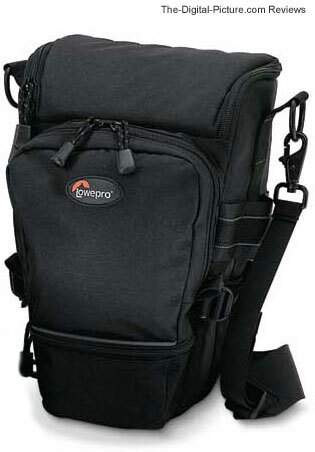 Note: The Lowepro Toploader 75 AW has been replaced by the Lowepro Toploader Pro 75 AW. Lowepro has replaced the Lowepro Toploader 75 AW with the Lowepro Toploader Pro 75 AW. It is even nicer than the previous model, but note that there is only one SlipLock attachment loop and the dimensions have changed. Toploader cases continue to be one of my most-used camera case types and the new "Pro" version of Lowepro's Toploaders are better than ever. I have and use all three models of this line. Sometimes choosing a digital SLR is easier than choosing the camera bag to carry it in. The camera case I selected for my primary use bag is the Lowepro Toploader 75 AW. It is a high quality case that fits my needs very well. I like the ease of use a toploader case provides. I can throw the case over my shoulder and go. I have full and easy access to everything without putting the case down. The size of the Lowepro Toploader 75 AW accommodates a DSLR body (including 1-Series pro models) and a lens up to and including the Canon EF 70-200mm f/2.8 L IS USM Lens and the Canon EF 100-400mm f/4.5-5.6 L IS USM Lens. A Canon Extender EF 1.4x II will also fit installed on the 70-200 on a non-pro body, but things start getting very tight. The Canon EF 300mm f/4.0 L IS USM Lens will also fit installed on a non-pro body - again the fit is tight. The Canon EF 24-70mm f/2.8 L USM Lens will fit with the hood in place (not reversed) even on a 1-Series body. The case is deep enough to hold a small lens under a mounted small lens if you wish. I would put some padding between the two (one piece is included). There are SlipLock slots on each side of the case to accommodate 2 additional Lowepro SlipLock cases. I typically mount my primary lens on the camera body and SlipLock-attach up to two other lenses in Lowepro Lens Cases to the sides of the Lowepro Toploader 75 AW. The "AW" designation indicates "All Weather". Lowepro includes a rain coat that pulls out of a pouch underneath to provide water protection. The case by itself could be called weather-resistant (not water proof), but the AW rain coat adds to this protection. Basically, the Lowepro Toploader 75 AW is a great all-around top-loading camera case.